Scrumpy & Western website. Made In Somerset from cider! The New Forest Plonkers band page. Who Are The New Forest Plonkers? 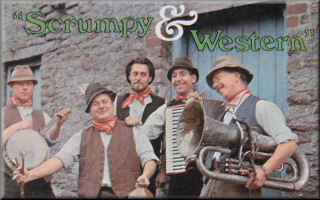 The New Forest Plonkers started practising together as a bunch of enthusiastic Scrumpy and Western musicians and singers early in 2002. 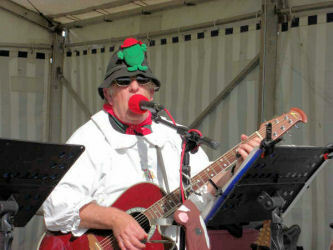 Mucker Mike, who leads the band on stage, had previously been a backing singer for a similar band, and fell naturally into his new role. Rough Rex (vocals and trombone) and Lord Hayrick (piano accordion) had both been lead musicians for the same band. Crafty Clive joined and added his own brand of country humour. With his gravel voice and experience on the guitar, he provides an interesting contrast to Mucker Mike’s silage-rich voice. After wearing out two drummers, they persuaded Lady Muck-Spreader to put down her tambourine and use her skills to better use on the drums (please note that it were the band that wore out the two drummers, not Lady M-S!). Georgie picked up her tambourine, and - with occasional agricultural sounds on her saxophone as well - can be heard at some of our shows. 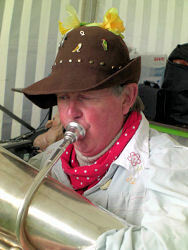 Compost John on the tuba, whose deep wind can be ‘eard all round the showground, adds the farmyard atmosphere most would like to avoid! The last to join was Bumpkin Bill who started life composing, and now is rapidly decomposing! But, ‘is tonsils are magic - just wait ‘till you ‘ear ‘im sing. 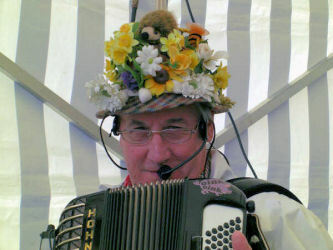 Being keen fans of the Adge Cutler brand of music and West Country humour, they try and follow the tradition by playing West Country cider-drinking music and songs. If they can’t find enough cider-drinking songs - well, they just play drinking songs, interspersed with the odd Irish number and traditional ditty to keep your feet tapping. Dressed in their country smocks, gaiters and neckerchiefs, they certainly draw the crowds - although they are not sure if it’s out of curiosity or their love of music, but they certainly draw ‘em! Typical songs you will hear The New Forest Plonkers play are Cider Drinker, Landlord, Combine Harvester, Chicken Catcher and The Blackbird. 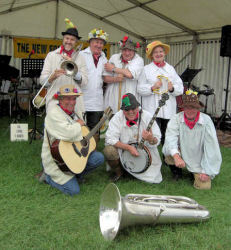 The New Forest Plonkers at Sherborne (2007): Group - back row left to right (standing) Rustic Rex, Lord Hayrick, Mucker Mike and Lady Muck-Spreader. Front row left to right: Bumpkin Bill, Crafty Clive and Compost John. - Lord Hayrick of The New Forest Plonkers for the information.